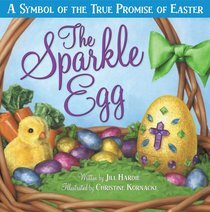 A new Easter tradition from the author of The Sparkle Box. Easter is coming, and Sam loves Easter! But this year, he is upset about a lie he told his parents. Even though he apologized and they forgave him, Sam can't shake the feeling that he is a bad kid for what he did. Meanwhile, his parents help him make a special Easter craft called a Sparkle Egg. His mom tells him to write anything he feels sorry about or ashamed of on a piece of paper and put it inside his Sparkle Egg. On Easter morning, when he opens his Sparkle Egg expecting a surprise, Sam finds that it is empty! His parents explain that because Jesus died and rose again, we are forgiven. Like the tomb that first Easter Day, Sam's egg is empty -- and Sam's wrongdoing is completely forgiven. Once he accepts this forgiveness fully, Sam realizes a truth: we can sparkle and shine with God's light when we let God's gift of grace into our hearts. Ages 4-8.